You are at:Home»Cycling»Pop the Champagne! 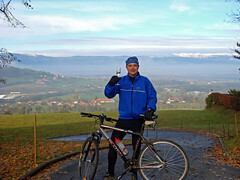 Nov 25 - Today, on a crisp, cold sunny day, I completed my 2007 challenge. Nov 25 – Today, on a crisp, cold, sunny day, I completed my 2007 challenge to cycle 160,00 metres of vertical ascent (about 525,000 feet or one foot for every minute of the year). My always enthusiastic and supportive wife was out to film this (to me at least) big event and to open the champagne. I must admit I spilled most of it while riding. 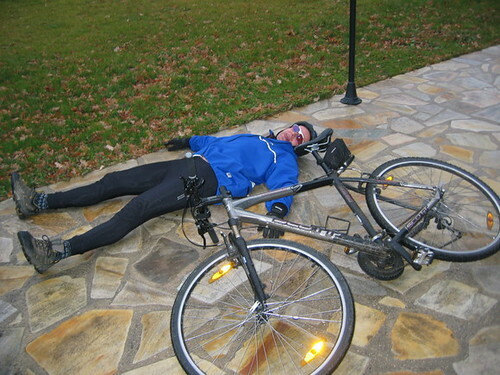 Ever since 2005, If nothing else, my silly challenges have motivated me to cycle far more than I otherwise would – especially during the cold months. Making a public declaration means failure is not an option. It’s helped me lose weight and even on the worst weather days, I always feel much happier for having ridden. This year’s challenge really suited me, as I love to explore the endless great climbs near me in the Alps and Jura mountains. As I recently explained to a friend, often much of the enjoyment comes after the climb – the sense of accomplishment and the memories. A few favorite photos from the year (click to enlarge). My 2005 challenge of 10,000 kms took until Christmas day – but fear of a snowy December meant I tried to stay a little ahead of schedule this year. My 2008 Challenge will be announced January 1st. Any suggestions? Next Article A Monster of a Climb? Felicitations!! What an amazing achievement — I am very proud of your hard work to achieve your goal. For next year you should try to do 200,000 metres on the road, and another 50,000 off road. That is if you do much off roading over there. That’d be alot of climbing but alot of fun. Well done you old bugger 🙂 Sorry I missed the champagne ride up the Champs-Elysees. Well done. Your website is an inspiration. i check it periodically from my desk at work to plot my climbs around Annecy. Wonderful photos and the profiles are great. thx for messages – Slogfester, I really like the sound of that – but you are too much stronger than me to be my domestique. 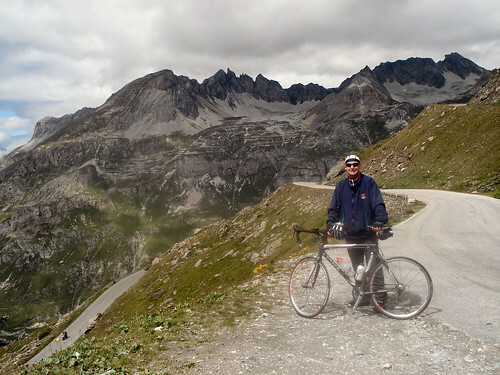 Stuard – Anncey is cycling paradise – we are lucky.